You’d be surprised at how many moms these days still struggle with the concept of a diaper bag. We can’t blame them for thinking that: after all, if you already have a tote or shoulder bag that fits a few diapers, it just doesn’t seem necessary to carry around another bag for your baby’s needs. But the reality is that mothers and babies alike both need enough storage for a full day out of town. Babies need around 6 up to 10 diapers a day. Where’s a mom to fit her stuff in between all those diapers? Aside from the obvious logistical nightmare posed by forcing your tote to perform as a diaper bag, there are other problems. In doing so, you’ll easily break your favorite tote quicker than the next diaper change. Also, you don’t really want to expose your preferred bag to spilled milk and poopy diapers, do you? Another thing to consider is that moms need diaper bags that have specific pockets because a handbag will have little to none. A tote is fine if all you need to carry is your wallet, phone, and keys. It simply isn’t the way to go when you also have to pack diapers as well as wipes, snacks, bottles, toys, and clothes. Thankfully, you no longer have to choose between the two. The Skip Hop Forma Diaper Backpack is the solution for moms on the go. It’s easily the most beautiful diaper bag/ladies’ backpack hybrid in the market – precisely because it doesn’t look like one at all. This bag has enough storage to fit the necessities of up to two kids in one chic backpack style. 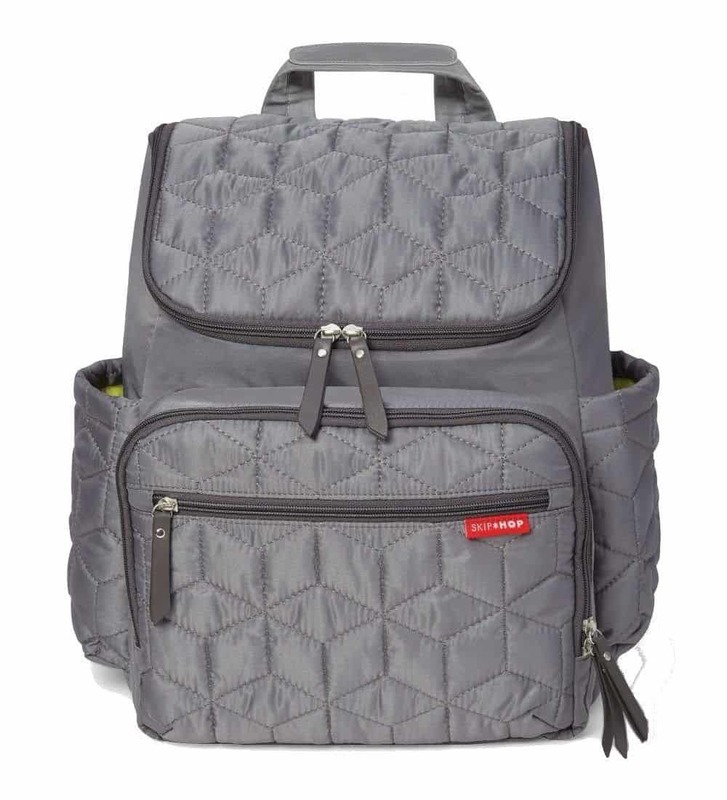 It’s the ultimate hands-free diaper bag that features a top handle, cushioned shoulder straps, and stroller straps for ease of use on you or attaching on the stroller. Thanks to this bag, traveling with babies has never been easier. Another reason to love this bag is that the Skip Hop Forma Diaper Backpack is on the affordable side of the price spectrum. No wonder it’s such a talked about bag among moms. Considering the hassles and time that this bag will save you, you’re definitely getting your money’s worth. Skip Hop is a trusted brand known for designing innovative solutions for the needs of parents, babies, and toddlers. Skip Hop’s humble beginnings date back to 2003 when new parents Ellen and Michael Diamant struggled with the dearth of diaper bag choices in the market. They created one that was as stylish as it was highly functional, catering to on-the-go parents just like them. The pair found the winning approach: innovative design that meets practicality, and many years later, it’s still evident in all their products. The Skip Hop Forma Diaper Backpack has everything you need for a day out with your baby. They literally thought of everything for this bag! Gone are the days when mothers would be prone to forgetting to pack a bottle or a snack (it’s all those sleepless nights). This bag’s clever features are pretty much like a reminder: you’ve got insulated packing cubes and side pockets for bottles, plus a multipurpose mesh cube for organizing a change of clothes and snacks. It’s also equipped with a washable changing pad pocket that can also function as a laptop or tablet holder when not in use. Another considerate feature is that this bag comes equipped with two packing cubes which fit seamlessly into the front zip pocket, allowing you easy access to essentials. It’s lightweight too, so there’s no need to worry about it weighing you down. All the thoughtful features of the multipurpose Skip Hop Forma Diaper Backpack make it clear that having this bag will make the life of a parent much easier. Its exterior is constructed with water-resistant quilted polyester fabric; all the materials used to create this bag are PVC-free and phthalate-free. Got a few stains on your bag? No worries: with mild detergent and a damp cloth, wiping it down clean is a breeze. The Skip Hop Forma Diaper Backpack is a necessity for modern mothers. It can pack a shocking amount of things, yet everything is held up in a neat, compact manner inside the bag. And while it was designed as a diaper bag, it’s stylish enough to be used for traveling or as a daypack. Best of all, this diaper bag won’t break the bank. The Skip Hop Forma Diaper Backpack is a practical choice for busy moms. If you’re constantly on the go, you may be hard-pressed to find a hands-free diaper bag that’s as feature-rich as this one. As a bonus, it’s so versatile that it’s like buying several bags for the price of one. 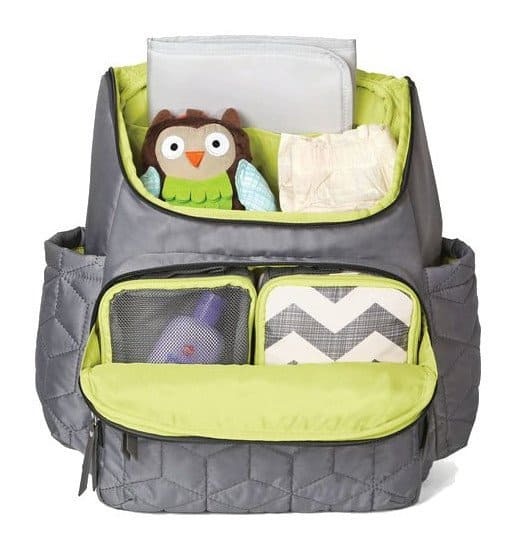 Based on customer reviews, parents adore this diaper bag. They have written about how every single one of its compartments, pockets, and packing cubes come very much in handy. A few customers have also commented about how this bag is extra useful on those occasions when you have to run after your kid or attend to any concerns with your children, simply by keeping your hands free with no worries of your belongings getting lost or falling out – and for that, they are grateful. It’s also an added perk that it protects laptops, according to reviews. Unfortunately, there were some parents who were disappointed about the faulty seams and the straps that tend to break easily. Parts of the embroidery also came apart after a few months, as noted by some customers. A few customers say that more padding and longer straps could have also helped. Overall, most customers sing praises for the Skip Hop Forma Diaper Backpack. It goes above and beyond your average diaper bag, and is certainly well worth the price especially considering its versatility. The amazing Skip Hop Forma Diaper Backpack can be purchased online, hassle-free at your favorite online shopping website. We recommend checking out Lazada Philippines for their terrific deals on diaper bags. There are so many responsibilities that come with being a parent. Day in and day out, it’s critical to remember the many new ways of taking care of your child. The Skip Hop Forma Diaper Backpack makes things easier by actually enabling you to enjoy the time you spend with family outside.